Your default browser is opened automatically when you click on a URL in a mail application (like Thunderbird or Outlook), an Internet shortcut, or an HTML file. 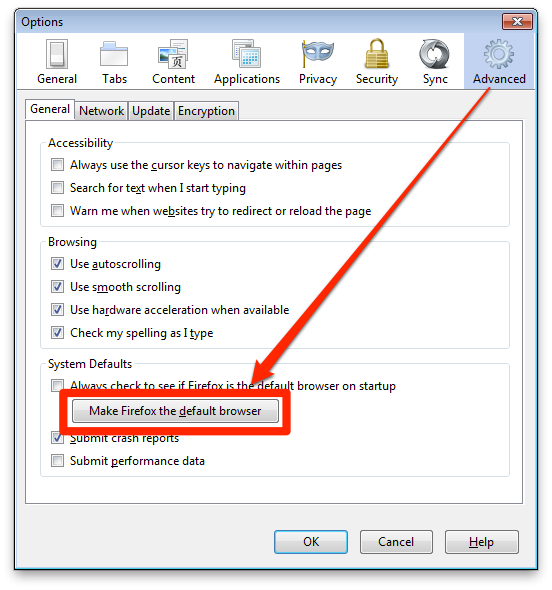 This article will show you how to make Firefox your default browser. Note: MSN Messenger and other applications may be created to open Internet Explorer, no matter which browser is set as the default. Also, Internet service providers like PeoplePC Online, Juno and NetZero may provide connection software that automatically launches Internet Explorer. If it isn't already selected, select the Advanced panel, then click the General tab, and then click Check Now. If it isn't already selected, select the Main panel, and then click Check Now. Select Yes to set Firefox as your default browser. To change Firefox to no longer be the default browser, you'll have to set another browser to be the default.